Giuseppe Ghedina was born on 29 July 1972 into a family of photographers. His grandfather, of the same name, was one of the pioneers of photography in Cortina d’Ampezzo and the Dolomites, but it was the younger Giuseppe’s passion for the mountains that made him discover photography for himself. The practices of mountaineering, climbing, and backcountry skiing helped him discover the vast variety of different viewpoints the mountains of his country had to offer. It has also helped him envision the mountains that lie beyond Italy, as he has travelled all over the world and photographed in Nepal, Chile, Argentina, Norway, Pakistan, Svalbard, and Morocco. Today Giuseppe is a professional photographer, and his passion for the mountains is communicated through his photography – outdoor sports, landscapes, and panoramas. He works with magazines and specialized agencies, organizes photographic courses and workshops, and has published several books including “BIANCO SU BIANCO” (“WHITE ON WHITE”) – a photographic journey celebrating off-piste skiing at eleven mountain regions in the Alps, and “K2 EXPEDITION” – a photographic book documenting the alpine expedition celebrating the 50th anniversary of the conquest of K2. 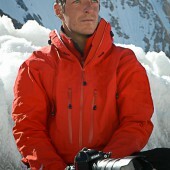 He is a member of TAU VISUAL (the Italian Professional Photographers Association), NPS (Nikon Professional Service), and a voluntary rescuer of the Alpine Rescue of Cortina.